Whether you're renovating a period home in Georgetown, New York City, or St. Augustine, you'll find that today's panel doors capture the spirit of your chosen era. Sturdy and durable, six-panel doors remain one of the most popular entry doors across many architectural styles. You can choose vinyl panel doors with their wide range of colors and affordability, or choose historically accurate wooden doors that are painted to suit your decor with precision. Both kinds of doors accept period hardware with contemporary keypad locks or deadbolts for optimum security. 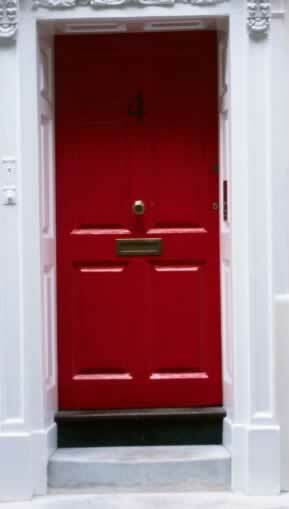 These panel doors are renowned for their structural integrity and long-term wear. This example shows that you don't have to compromise on appearance to suit practicality. The center pull is reminiscent of hardware typical of 18th Century city brownstones and row-houses. Wide, ample kick panels extend protection against the wear and tear of daily living.